E27 (1″) screw-in bulb; rated at 75W. Suitable for Nocturnal or Dinural species. Provides heat essential for digestion and activity. 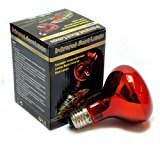 Infra red lamps produce heat by emitting infra red waves and also produce a dim red light. This makes them suitable for Dinural as well as Nocturnal species. The dim red light will not disturb normal activity during the night or day which makes them an excellent 24hr heat source. Can be combined with the Daylight UVA bulbs to make a complete lighting system; or the compact UVB for species that require UVA and UVB. Also suitable as heat source for small animals or birds. ES screw type fitting E27 (1″); rated at 75W. This entry was posted in Reptiles and tagged Heat, Infra, Lamp, Reptile, ScrewIn, tortoise, Vivarium by One Boutique. Bookmark the permalink.